RecipeSavants.com What do you get when you mix curry powder, allspice, coriander, paprika, ground fennel seed, and cayenne pepper? A fish dish with a flavorful profile that thrills your taste buds. The fantastic thing about this recipe is that you can use any fish you like, or even with scallops. Help your family discover grilled fish with a whole new twist. Smart Recipes, Caribbean Recipes, Fish,Eggs Recipes, Recipes Fish,Eggs Caribbean Caribbean Fish With Mango Salsa PT35M Serves 5 Ingredients: 1 Tablespoon Paprika 2 Teaspoons Curry Powder 2 Teaspoons Ground Cumin 1.5 Teaspoons Ground Allspice 1 Teaspoon Ground Ginger 1 Teaspoon Ground Coriander 0.75 Teaspoon Salt & Freshly Ground Black Pepper 0.25 Teaspoon Ground Fennel 0.125 Teaspoon Ground Cayenne Pepper 1 Egg 0.33 Cup Milk 1 Cup Panko Bread Crumbs 1 Tablespoon Shredded Unsweetened Coconut 1 Tablespoon Olive Oil 5 Tilapia Fillets 3 Cups Mango Salsa Mix curry powder with paprika, allspice, cumin, coriander, black pepper, cayenne pepper, ginger, salt and curry powder in a bowl, and stir until well combined. Whisk milk with egg in a bowl. Mix coconut shreds with panko crumbs and 1 tablespoon of spice mix in a shallow bowl. Meanwhile, heat the oil over medium-high heat in a cast iron frying pan. First dip the tilapia fillets into the egg mixture, then coat both the sides with crumbs mixture. Fry the seasoned and breaded fillets for 2 minutes per side, or until golden brown. 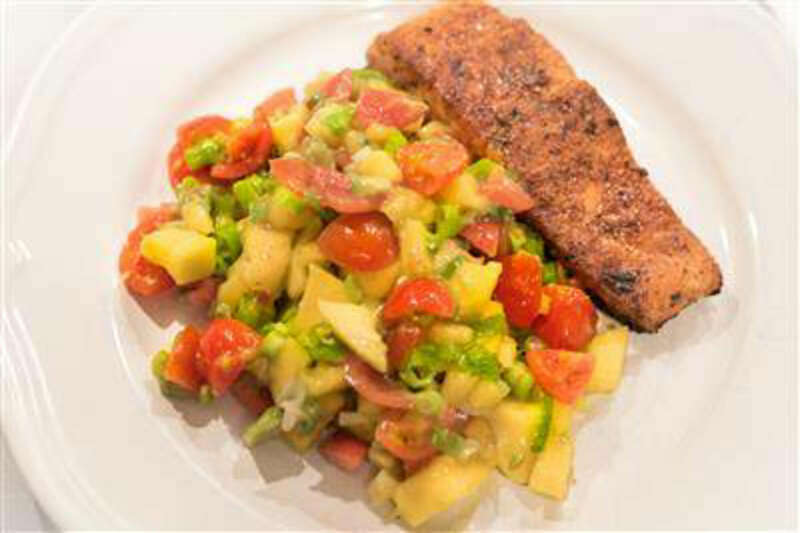 Serve with chilled mango salsa.